The Best of Teacher Entrepreneurs II: Math Lesson - "Test Prep Morning Worksheets Math and ELA"
Math Lesson - "Test Prep Morning Worksheets Math and ELA"
Testing is a month or less away for many of us! I've found ways to utilize our math books. I use these sheets as morning work to reinforce my students' understanding of specific Common Core standards in math and ELA. Testing just makes us all go crazy. I don't know about you, but I feel like I can't breath and there's no time to fit everything in. How many of you have had 10+ snow days! That's me!! Prep your students with review using these math and ELA worksheets. These sheets correlate with the Go Math! series Chapter's 9 and 10, but they can also be used alone. They review fractions, decimals, and symmetry along with several ELA concepts. This works great for 3rd grade as well. 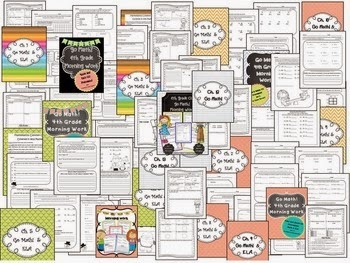 Be sure to check out my bundle of all of the Morning Work review sheets below!